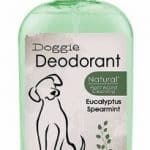 We just talked about dog sprays in the previous article, let’s a glance at dog’s food containers in this article. A majority of dog owners add some form of kibble in their dog’s diet. To save time and benefit from quantity discounts associated with buying this dog food, we prefer to acquire the kibble in large quantities. Though it is scheduled to serve for some more extended period, the package it comes in does not well suit that purpose. Some can be resealed, well, but the seal remains too loose hence cannot serve for a long period. Remember that this food needs to be kept away from ants among other pests. It also requires proper storage to prevent it from getting stale. 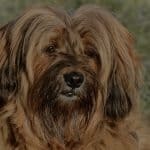 Some dogs tend to be very sensitive and therefore can’t take stale food. This translates to much loss; remember that the dog has to eat, so you have to get your fresh dog food from the market. 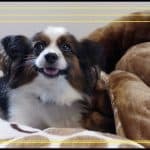 However, there is a solution that will help you save your money and ensure that the dog food still retains its freshness. Using a dog food container is the perfect way to keep the dog food safe. These containers come in different forms. It’s upon you to choose the food container that will serve to fulfill your needs to maximum satisfaction. But before making the purchase, make sure that you are purchasing the best product. So according to our review, here are the best that are currently available in the market. Factors To Be Considered Before Buying. Product Dimensions: 16.7 x 12.8 x 33.9 in. 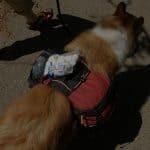 Because dogs and other pets are part of the family too, they need a spot to store their items. 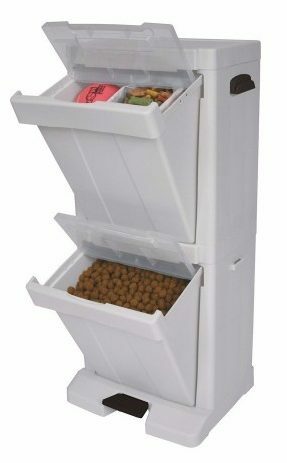 Richell’s pet stuff tower is the perfect solution for storing dry food, treats, toys and more in one easy location. 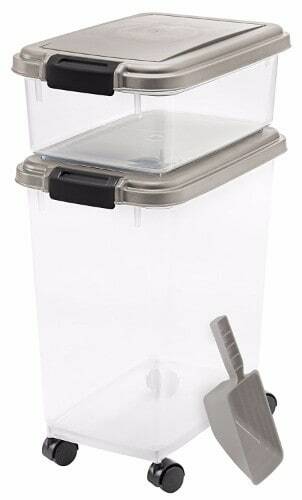 Furthermore, the tower contains two storage bins with snap-lock lids to keep food fresh and lock in odors. Bottom bin has a foot pedal for convenient hands-free access to pet food. Side hooks hold leashes and bags. Also, this food container comes with 1.5 cup scoop. If you have limited space, you might consider this slim profile storage tower. The whole unit can be wall-mounted to save you even more floor space. The doors do not remain open; you have to hold the door with one hand and use the other to scoop the dog food which results in multiple spills. Product Dimensions: 8.9 x 7.1 x 3.3 in. 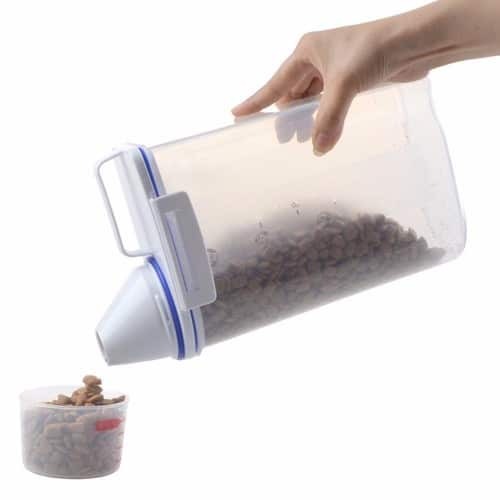 Need a pet food container that you can carry in the car? If yes, PYRUS storage food container is what you should go for. Having made of food-grade environmental PP material, this container does not smell. The translucent nature allows you to monitor the food level while the measuring cup (with a scale) helps to control the dog’s appetite easily. Lastly, it’s easy to grasp when using, easy to clean and perfect for indoor, outdoor and traveling. Product Dimensions: 18.1 x 15.2 x 17.8 in. 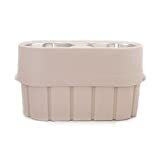 This food storage container is made from rugged, high-density polyethylene, making it rust- and dent-proof and suitable for indoor or outdoor use. 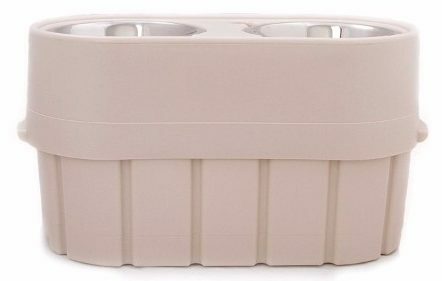 These multi-use stackable storage containers can store and organize all materials used for dogs. It is attractively designed for the home. 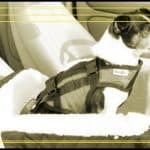 On top of that, the design helps you to enjoy an active lifestyle with your dog or any other pet. They are available in three convenient sizes and are great for storing anything! It’s easy to open the container- the dogs can do it by themselves. Product Dimensions: 10.2 x 11 x 6.5 in. Why give ants the chance to enjoy your pup’s food? It’s time to keep these ants off and let the pups enjoy their food. Pureness dog food container is there to serve that purpose. This is a storage container that works perfectly for those with small dogs. Also, the fresh-tie seal ensures that the foods for your pets will be kept in a longer period with a reduction in moisture. Let’s keep the ants off! Work fantastic for keeping pup’s food. 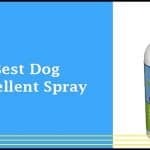 Only available in small sizes- can’t be used to store big dog’s food because of its limited capacity. Product Dimensions: 22.4 x 9.8 x 8 in. This has the best design. Need to save more space? This is the perfect product for you as it combines both storage and feeding area. Moreover, it comes complete with two metal dishes, but you can take one out and put a water bottle into the notch on one side to create a self-watering system. This self-watering system allows the use of a bottle for frequent watering. It can store up to 15 lbs. of dry dog food. The height adjusts from 8 to 12’’ by rotating 180 degrees! Product Dimensions: 6.2 x 6.2 x 12.5 in. The container from OXO is large enough to store more food things. It was manufactured from a BPA-free plastic which is harmless to the environment. As described by the manufacturer, this container is suitable for both dog, cat, birds, or even hamster foods as well. One of the good point about this container is that it comes with a unique button. Once you push it, it will create an airtight seal for the whole container. It looks nice especially on the kitchen counter as compared to other food containers. Product Dimensions: 18.1 x 10.4 x 19.4 in. 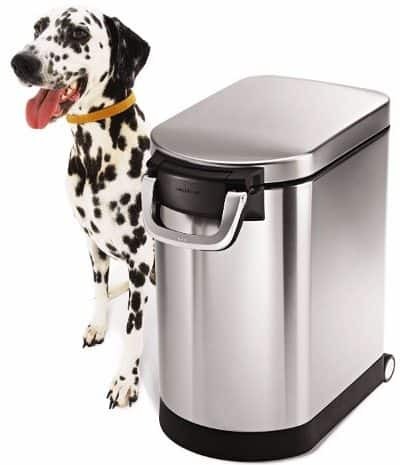 Simplehuman pet container not only stores your dog food elegantly and safe but also the stainless steel tin allows you to match the container with most of the house modern fixtures. Also, the airtight seal help to keep the food fresh, built-in wheels allow for easy movement of the container. Furthermore, it has a large capacity to provide enough space for storage. 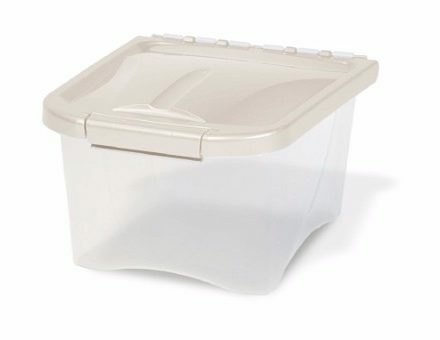 Besides all these features, this container also has a lid-mounted scoop that attaches neatly under the lid for easy access. This container has a heavy duty handle clamp. Product Dimensions: 9.8 x 10.5 x 12.2 in. If you are yet to give this food storage container a try, I would recommend you try it out. 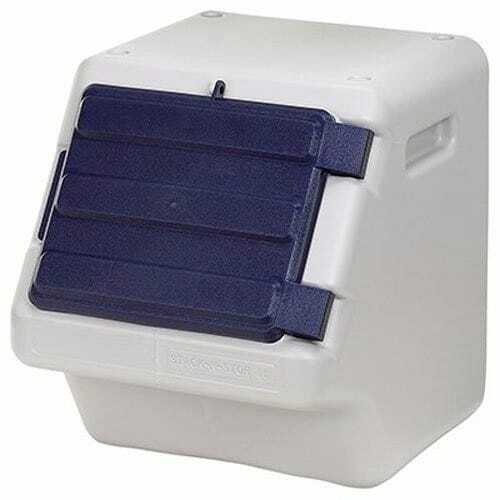 Also, the container is ideal for owners of small dogs and cats who want to store 10-lbs. of pet food. The fresh-tight seal ensures that in any circumstances, you can always keep your dog’s food in a longer period. This could be the container you have been searching for years. Just give a try, and for sure you will hardly regret. The in-built wheels ensure that they don’t fall off. May not be a better option for keeping the food away from ant’s reach. Product Dimensions: 12 x 18 x 15.5 in. 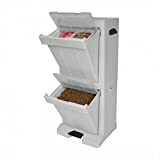 This is a dog food container that besides storing your dog’s food safe from pests and getting stale has also an outstanding design. Furthermore, this container is made of high-density polyethylene, and it is BPA free. The container can be considered one of the best. By coming with an airtight seal feature, it can help you to keep your pet food dry and fresh with a pest-free condition. 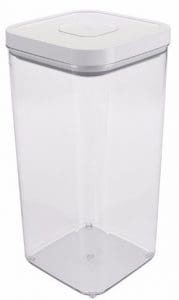 It is also known to be a durable container as it was made with premium heavy-duty construction. 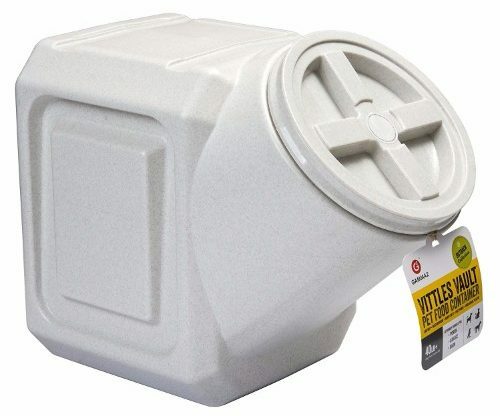 Lastly, Vittles Vault Airtight Stackable Pet Food Container is completely recyclable. Heavy duty; can last for decades- literally! Product Dimensions: 16.5 x 10.8 x 18.6 in. This stacking 3-piece combo includes a 33-quart container, 12-quart container, and a 2-cup matching food scoop. The 33-quart container holds up to 25-lbs. While the 12-quart container holds up to 10-lbs. Both containers feature airtight seals and snap-lock latches to keep out moisture, humidity, and pests. 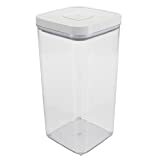 With this container, you don’t have to open it to check for the food level- the translucent body allows you to check food level at a glance. Great for dog food, cat food, bird seed, treats or any pet food. 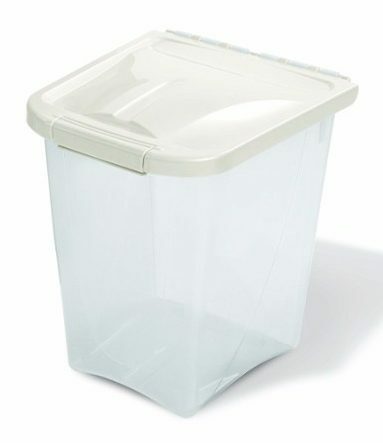 And because of the airtight seal, these containers are also great for people food like flour or sugar. Ability to prevent dog food from getting stale. The size of the container is determined by the quantity you intend it to hold. If you buy the dog food in large quantities, then definitely you have to go for the larger container with enough capacity to keep the food. This is very obvious; take an example of what you consider when building a granary or a store to keep your harvest. The first thing to look at is the size; you decide the size by checking how much you usually harvest. It’s not different in the dog’s case. Consider a cupboard. It’s divided into different sections. We use single section for storing cups, another for plates and so on. We do that because we don’t want to store cups and plates in the same place maybe because of uniformity or accessibility. Same happens in the case of a dog container. If we acquire many varieties of food, then we have to go for food containers that are divided into sections. In anything we acquire, durability is always one of the things to flash into our minds. Durability may be decided by how safe we handle the container. However, this is not the only secret; the material used to make the food container is another determinant of how long the container can serve. The materials are different; some are made of metal while others plastic. As we all know that we have different types of metals and plastics, whether the container is metallic or plastic, the specific type will always be a great determinant. This is another factor that will always come to our mind regardless of what we are buying. Cost decision depends on the size of your pocket. A vast majority always want to acquire the best item using the minimum cost; that is good considering that money is a scarce resource. Having other factors held constant, you have to buy what you can freely afford. However sometimes it depends on whatever we prioritize. If we prioritize cost factor, well other factors have to come after that. This is another critical factor that we should into consideration. Accessibility is about how long it takes to have access to the stored food. Here, you consider how long it takes to open the container. Some take much time and effort to open which may become annoying especially if you have other activities to attend to. Purchase a container that you can easily open using the minimum time- you don’t have to sweat to open your container. Having considered the five major factors, we also have minor factors. Consider the color- is it your favorite? Does the container come with a scoop? Weight and how ease of moving the container- do you have to carry, or it has wheels? What about the handle- is it strong enough to support the weight of both the container and the dog food for a reasonable amount of time? 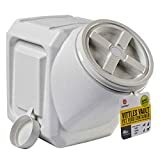 Though the reviewed dog food storage containers work good to keep your food safe from pests and getting stale, Iris 3-piece Airtight pet food container is the best that container you should go for. Besides having airtight seals, this container has another secret-it’s highly flexible as it can store foods not only for your dog but also your cat, and other pet animals. You can even get one for any of your pet if you prefer that.